Coffee, Beer and Community in Northtowne. Colony KC is a multi-faceted bar that focuses on the craft beverage movement including beer, cocktails, espresso & coffee, while providing a calming environment. 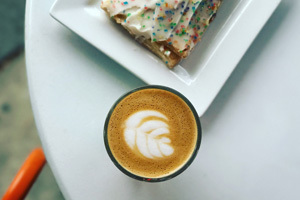 In addition to offering craft beer, cocktails, craft espresso, and artisan coffee, Colony offers fresh baked goods from Scratch Bakery. Our product line includes 12 rotating craft taps, 80+ rotating craft bottled/canned beers, craft espresso/coffee from Post Coffee (Lee's Summit, MO) & Parlor Roasters (Brooklyn, NYC). As a family owned and operated establishment we pride ourselves on emphasizing local culture and supporting other small businesses. We are unique to Northtowne, allowing you to order food from any of your favorite North KC locations just like you would in your own home. Don’t want to wait for delivery? Feel free to bring food from home or any restaurant to enjoy with your favorite craft beverage in a relaxed, inviting, and family friendly atmosphere. We have snacks, games, music and of course an ever changing variety of craft libations! Colony is currently working on a brewery expansion. We will soon be serving up beer as Colony Handcrafted Ales. More info to come. We’re better together, which is why Colony KC is not a place for me or for you. It’s a place for us. Common ground where anyone and everyone can come together over a drink. Connection is the driving force behind healthy communities, so we hope to create the kind of space where those connections can take root and flourish. Come share a drink and, more importantly, share your story. Life is better when we’re in it together. Sour, IPA, or Stout, there's a beer here you're gonna like. Our encouragement is to come taste something you don't typically drink. Find a new favorite beer! We want to celebrate the roasters of this city. Find something local, or try another coffee that Colony has hand selected for the people of Kansas City to enjoy. Our handcrafted cocktail program mixes together classics and special recipes we've put together. We feature local libations from Union Horse, J. Rieger & Co., Tom's Town, S.D. Strong & Restless Spirits.